I have this photo of Ainsley taken this week that I think fits the word, "contemplative", for a two year old very well. She's certainly thoughtful alright, but she's also devious, as seen by the slight smile in her eyes. It's the contemplative looks like these from my two year old, that make me wonder dread what she could be planning next. This week I told her, "good night little angel" when I was putting her to bed. She looked up at me from her crib and said, "No I not ah angel, mommy. I'm two!" Not knowing what an angel is, she felt the need to be contradictory. Well spoken, Ainsley! Beautiful entry, she looks like a little angel! How precious! She is adorable!!! So sweet. She is adorable. She's smart! Loved the story! She's so precious! How cute is that story?! I think she's a keeper!!! 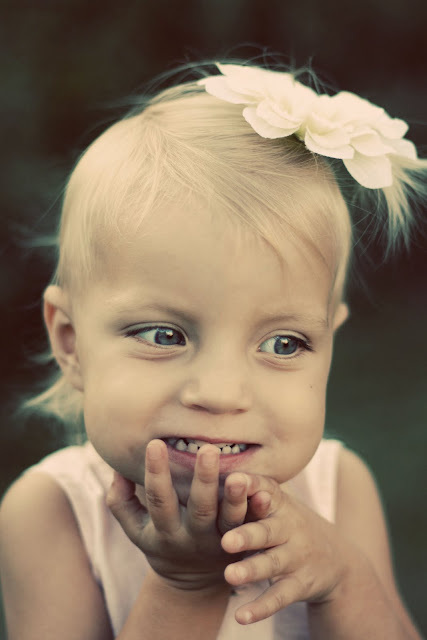 Love the story and your little "angel" is beautiful!